We are now fully booked for wedding CAKES for all of 2016. We do have a few spots open for cupcake and cakepop weddings in the fall. As we are so busy this season, consultations will be held on a limited basis, and we do not officially begin booked 2017 weddings until December 2016. We deliver to all of Edmonton and surrounding areas, as well as many areas outside of Edmonton, including but not limited to: Drayton Valley, Calmar, Devon, Camrose, Pigeon Lake, Etc...) Delivery charge is based on kilometers and time to destination. Set-up is always included with delivery at no additional cost. We always recommend that wedding cakes are delivered, due to their usual size and weight. Often, they will need to be assembled at the location. Delivery charges are $10 within Leduc to areas not in our designated free delivery area. All other areas are calculated at $1.25/kilometer from Leduc to the location of the reception venue. Working with you, we create fairytale cakes specially designed for your style. Our wedding cakes are all priced based on tier size. The tiers will serve different numbers of guests, based on how large you would like the serving size to be. We recommend a serving size of at least 2 x 1.25", so the highest number of servings is based on that calculation. 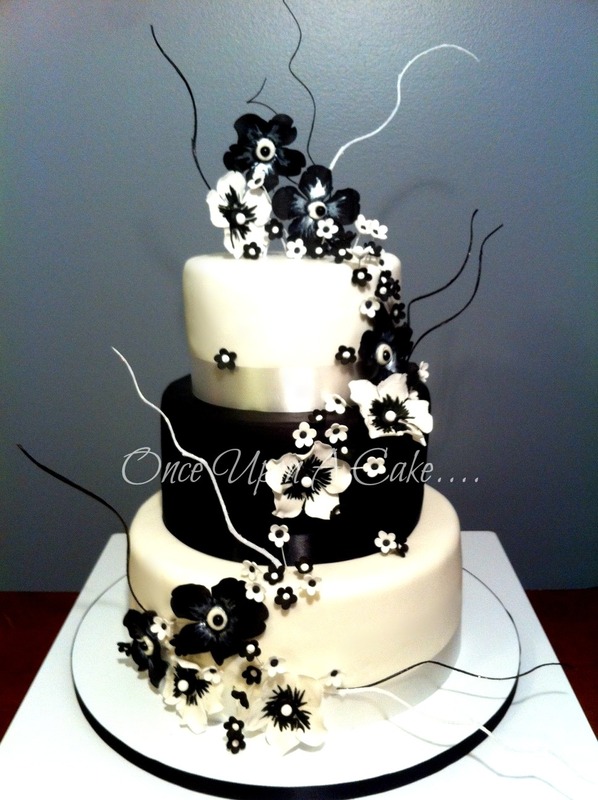 For any cake order over $200, we do ask for a 50% non-refundable deposit at time of booking. This secures the date for you, and allows to purchase materials we will need in advance. The final payment is due one week prior to the wedding. Pillars and Plates have a rental fee of $20-100 with a deposit required. Full size Wedding Cupcakes begin at $30/dozen for basic or $35/dozen for specialty chocolate bar cupcakes. Design and Decoration prices vary greatly based on complexity, supplies required and time. Generally decorated wedding cupcakes range between $40-75/dozen. We have 7 different cupcake stands available to rent. All are able to hold a 6" cake on the top for cutting. We charge $40 for stand rental for 5 days. We also require a $150 deposit, which is returned to you upon their return. We also have 3 different platter and plate setups (2 white & 1 clear) which rent for $50 with a $200-250 deposit depending on quantity of equipment.